Ideal storage solution for your tool boxes, power tools, gardening gear and due to its extra depth you could even fit your bike or mower in. It is designed to be placed to the side of your house and garage or under the eves or at the back of the carport. The colour YardSaver F83 is one of our BEST SELLERS due to its great convenient narrow design for a modern lifestyle. I was very happy with the whole process from purchase through to pickup and assembly of the shed. I've bought three of these sheds for family, so I'm obviously happy with them. Assembly is quite easy but you have to take care to get the shed square if you want all the holes to line up. Make sure the base is flat and level for best results. Easy to follow plans and video. Except for doors can easily mix up unless your mind is fully on the material if not, can make a couple of mistakes. Other than that very easy to follow. This shed is now mounted onto a treated pine floor. The instructions were clear and concise and anyone with a little DIY experience and a second pair of hands can assemble the structure is essential, but assembling the walls in a garage with one person is achievable. By the time the walls are assembled and put in place, everything is very rigid and even in high winds, the shed does not creek or move. Would highly recommend that you watch the videos a few times as it will supplement the booklet which needs a little more words to be explicit about what is happening, not just the graphics. 1. All of our Durabuilt models can be upgraded to sliding doors or perhaps check out the Ezislider as that comes with sliding doors as standard. 2. Flooring kit can be used permenanently, that is not a problem. 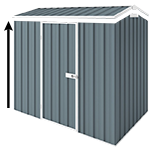 We have a picture of this shed on the flooring kit on this page here. Scroll down towards the bottom and you'll see a couple of pictures there. As you'll see there, the shed is placed on an uneven surface and it seems to fix that problem very well. 3. We don't provide installation at this point of time. I hope above helps. Feel free to let us know if you have any other questions please. Thank you.